It is fall! Pumpkins are everywhere! On our doorsteps, decorating our house, and in our food! Everywhere you look, there is pumpkin spiced this and pumpkin flavored that. The other day I was gifted a jar of pumpkin butter from Trader Joe's. 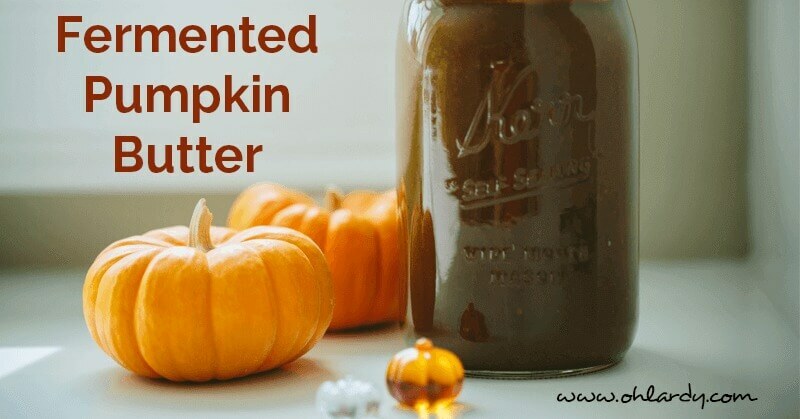 I have always wanted to try pumpkin butter, simply because it sounds divine! When I think of pumpkin butter, I imagine it to have this wonderful pumpkin flavor enhanced by simple spices such as cinnamon, nutmeg, and clove. When I took a taste of this pumpkin butter, it tasted like pumpkin pie filling. The spices were there, but so was the SUGAR! Holy moly, it was sweet. I knew I had to recreate pumpkin butter on my own terms. I wanted a pumpkin butter that is slightly sweet and spicy and it has to taste like pumpkin! And to top it all off, it had to be fermented. I mean, come on, this is Oh Lardy after all! 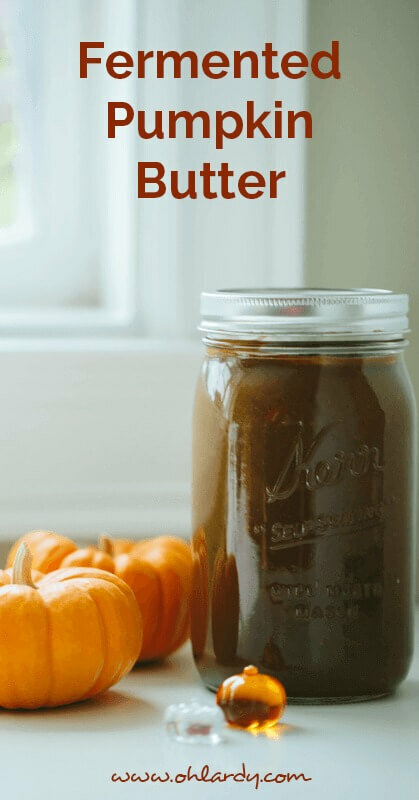 Making your own homemade pumpkin butter couldn't be easier. Throw everything in a pot, stir it all together, and cook it for a little bit. My plans for this pumpkin butter (besides eating it with a spoon) is to put it in oatmeal and spread it on cream cheese toast! Does the topic of fermenting baffle you? We created a Fermenting eCourse just for you and when you sign up, we will send you a Quick Start Guide! Grab the eCourse and the guide here! Place all ingredients except the lemon juice and culture starter into a pot and mix. Lower the heat and simmer for 35 minutes. Allow the pumpkin butter to cool. Add the lemon juice and culture starter and mix well. Place into a quart sized mason jar, add the lid, and allow to ferment at room temperature for 24 hours. Move the jar to the fridge and enjoy! How long does this last in the fridge? The reason I ask is because when I make fermented applesauce, it can get pretty alcohol-y in about 2 weeks. We usually eat it before that time period, but one time when we didn’t, it really packed a punch. I’m trying to find fermented foods to send back to college with my daughter and it needs to be something that can not only tolerate an 8 hour bus ride, but then be able to sit in her fridge for several weeks. Your recipe uses quart-sized mason jars. How many mason jars were you able to fill with one recipe? I filled one quart sized mason jar. For a quart, the rule of thumb is 2-4 tbsp of whey. The purpose of whey or culture is just to add some good bacteria to the mix to start the fermentation. Good luck!! Just curious, why do you cook it? I thought to ferment foods they needed to be raw. Thanks. I was wondering the same thing. Aren’t you destroying the good bacteria by cooking it? Would it be possible to use grad B maple syrup and get similar results? Also, I know that kefir grains in milk do not form alcohol. Have you ever tried kefir whey or grains with pumpkin to see if this moderates the alcohol level? By the way, a Native Hawaiian acquaintance once commented to me that she regularly made pumpkin poi. I think she was using a kabocha or buttercup type squash. This was before I had any experience with fermentation. Taro is also fermented to make poi. Makes me wonder, since they have been used in Asia to make a kind of whiskey if sweet potatoes would lacto-ferment effectively. I can’t see an answer to Mindy’s question. Why is it cooked? And especially why is the starter culture boiled (along with the rest of the ingredients) for 35 minutes? Wouldn’t this kill the culture? Do you think I can use Kombucha to ferment it? Would I use like 2-4 Tbs like you would the whey? The bacteria is added after the pumpkin is cooked and cooled. This looks so delicious! I really want to try this. I can’t imagine how delicious this would be as a dip for a dessert or on toast or something similar! And to think it is fermented so it will give you health benefits is amazing too! thank you for sharing this recipe!